What's It Like To Tour Titleist Ball Plant III? What’s It Like To Tour Titleist Ball Plant III? 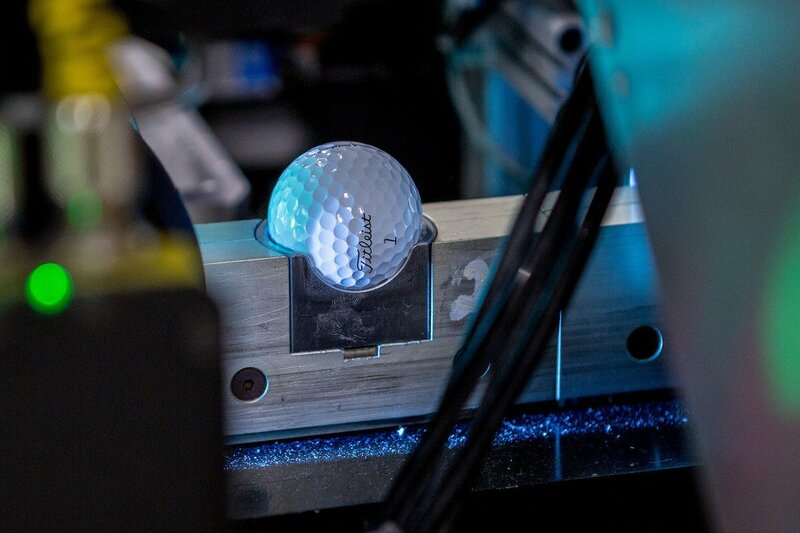 What's it like to tour @Titleist Ball Plant III? @GolfSpybarbajo shares his experience. At MyGolfSpy, we focus on golf equipment. I realize statement that may very well capture the “DUH” prize for 2017, but the reality is there’s more to golf than MOI, CG and ball speed. When you’re in your 80’s and reflecting on your golfing life, you won’t be thinking about how you adjusted your Epic, or what you thought of the M3. But you will remember that bucket list round with a lifelong friend, that hidden gem of a course you stumbled upon or the golf school package your spouse bought you for Christmas. We’re talking about experiences, the stuff of life. And in true #PowerToThePlayer style, MyGolfSpy will periodically offer up our take on golf experiences ranging from a no-cost quickie to a big-ticket trip of a lifetime. Are these adventures worth your time and money? As always, MGS is here to help. Soooo, welcome to the first installment of MyGolfSpy’s “What’s It Like To…” We might as well start out with a shocker. Yes, we went, and no, despite the jokes, we were not sent to the Pit of Misery. 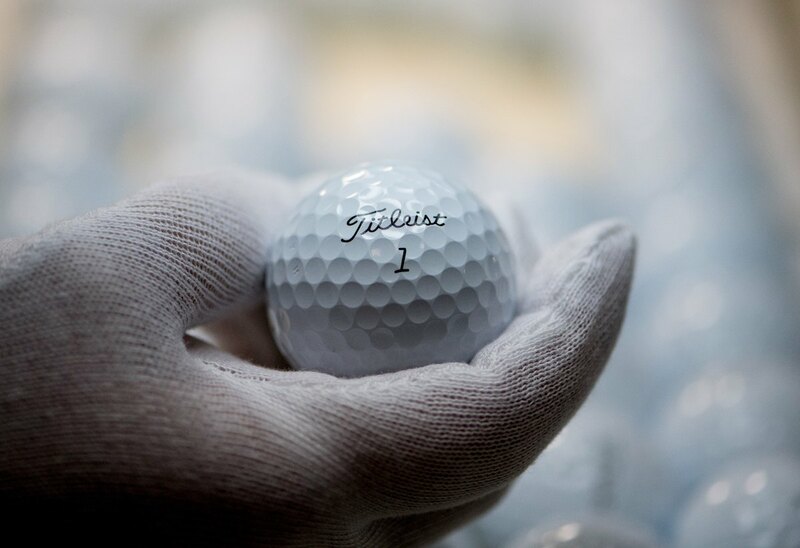 The Titleist ProV1 may not be your ball of choice, but you can’t deny it’s the ball by which all others are measured. If you had a dollar for every time someone asked “how does it compare to the ProV?,” you’d probably have enough money to buy, well, some ProV1s. Titleist has offered tours of its famed Ball Plant III in New Bedford, MA for years, usually for Tour players, PGA Pro’s and select customers only. This fall Titleist opened the doors to the general public, provided of course those members of the general public also belong to Team Titleist (which you can join for free). Often these types of free public tours provide only a cursory look at the operation before herding you into the gift shop. Titleist, however, gives you a 90-minute, in-depth, walk the floor and stick your nose into the machinery kind of tour, taking you from raw synthetic rubber all the way to painting and printing. You’ll see every step of the process, and if you care even the slightest bit about the golf balls you hit, the entire tour is utterly fascinating. The tour begins in a small welcome area featuring displays of the ProV1 and ProV1x at various stages of the manufacturing process. Our tour guide, Hank Conaty, is a recently retired 33-year Titleist vet whose last position was Senior Director of Engineering and Technology. During his career, Hank was involved in either developing or refining all of the processes we were about to see, and he delivers his technical insight in understandable terms that are pertinent to the non-engineer golfer. The program starts with a brief video on the history of Titleist. For a company with a fairly stodgy reputation, the video has some laughs. Jordan Spieth, Rickie Fowler, Ian Poulter and others are featured, with Poulter encouraging us to steal as many balls as we can during the tour. Hank quickly reminds us, in a chowdah-thick Boston accent, that Poultah was just kiddin’, and we should leave the bawls where they ahh. Titleist doesn’t allow cameras on the factory floor, and you have to leave your cell phone in a locker. We were allowed to take pictures in the welcome area, but all of the factory floor pictures in this piece were provided by Titleist. Consistency, reliability, and experience are words you’ll hear dozens of times during your Titleist tour. 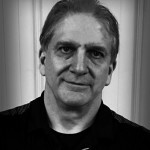 When marketing types use those words, they usually fade into white noise, but Hank is a scientist/engineer with a unique ability to explain how all the production steps are controlled, how those steps affect golf ball performance, and why it all matters to a golfer. The first stop is the boiler room, which made the HVAC geek in me tingle. 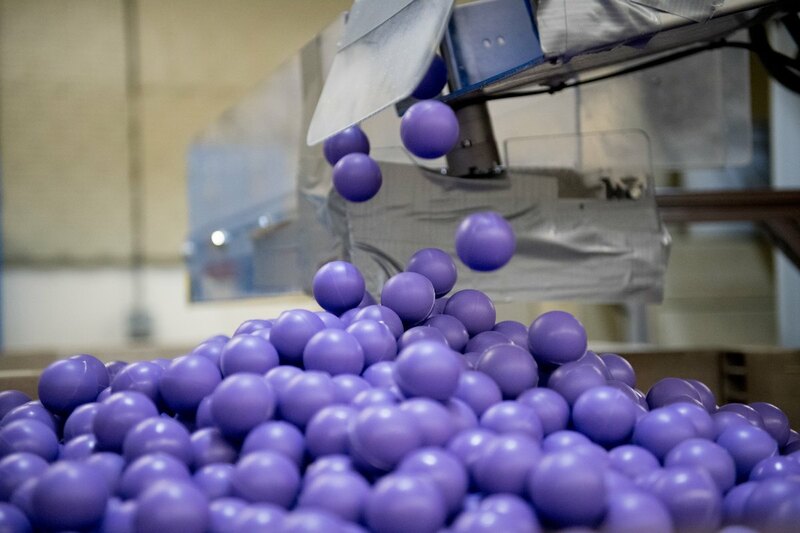 Hank told us heating and cooling are critical in production and are carefully controlled so each ball made has the exact same heat experience at each stage. Next is the mixing room, where Titleist makes synthetic rubber. Different thermoplastic compounds are mixed and melted to form the base material for the cores. The raw rubber comes out in slabs that look like big sheets of sod in green (ProV1 core), pink (ProV1x inner core) or purple (ProV1x outer core). 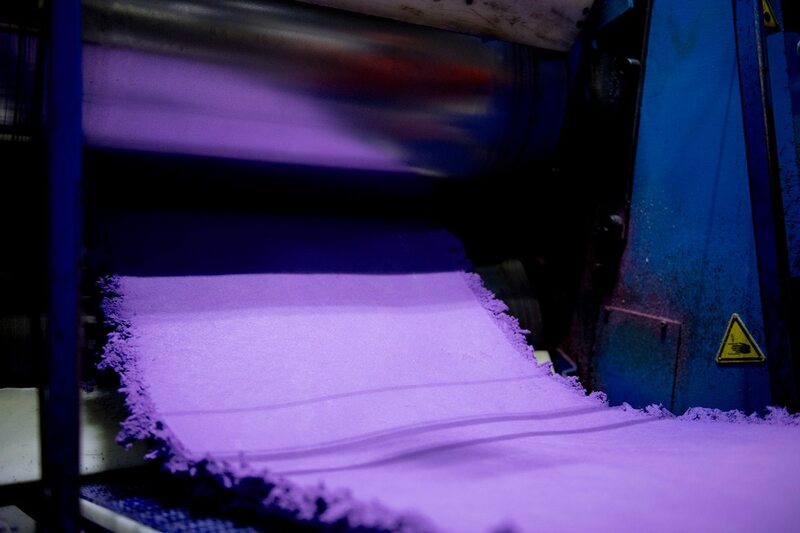 After a curing period, the raw rubber sheets move to extruders, where they’re formed into a long, thick cords and immediately cut into plugs. Those plugs will be molded into cores. The plugs are placed into large trays and, using a combination of heat and pressure, are molded into cores. This process – called cross-linking – changes the molecular structure of the synthetic rubber from a thermoplastic into a thermoset. At this point, the core can no longer be reground because it can’t melt. The next step for the core is the Glebar Room, for grinding, smoothing and polishing, after which they’re ready for the casing, or shell layer. The casing is a shell made of surlyn, the same material used in the cover for 2-piece balls. The shells go into a machine and are pressure molded around the cores. After more smoothing in the Glebar room, the cores are ready for the cast urethane cover. At this point the tour detours into the Quality Lab. Hank tells us Titleist constantly tests for size, compression, and concentricity – making sure everything is centered with no thickening or thinning of any of the layers. Balls that don’t pass the test don’t leave the building, and performance rejects are destroyed. There’s also a hitting machine in the quality lab, where cores and finished balls are tested for durability. They’ll hit balls 200 to 400 times to check the paint and printing. 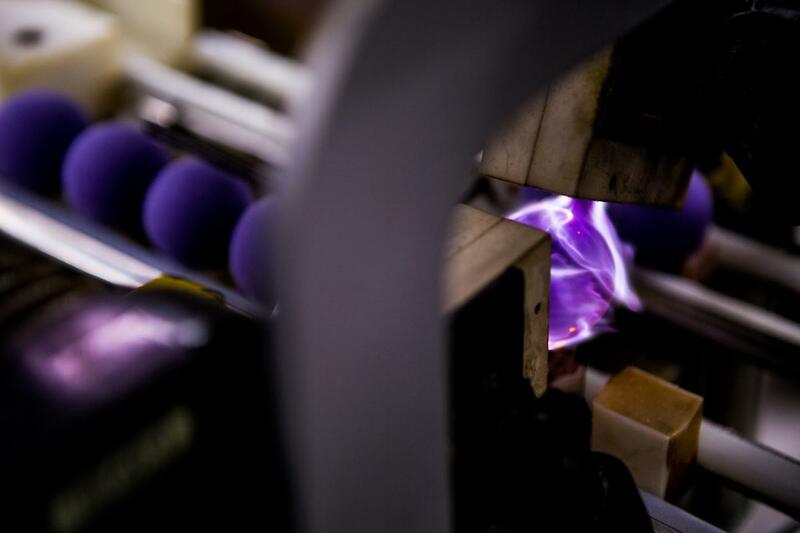 Ball Plant III is one of the few factories in the world capable of making cast urethane golf balls. Not only is the process fairly complicated, making the cover molds – with specific dimple patterns – is also complex. Hank tells us Titleist strives for vertical integration, making its own molds as well as the tooling and machinery used to make those molds. Unless you’re really into rubber, the cast urethane molding is the highlight of the tour. It’s a hot process, so the cores are first zapped by a flux capacitor/Back to the Future-looking machine, and then warmed to closely match the temperature of the liquid urethane. 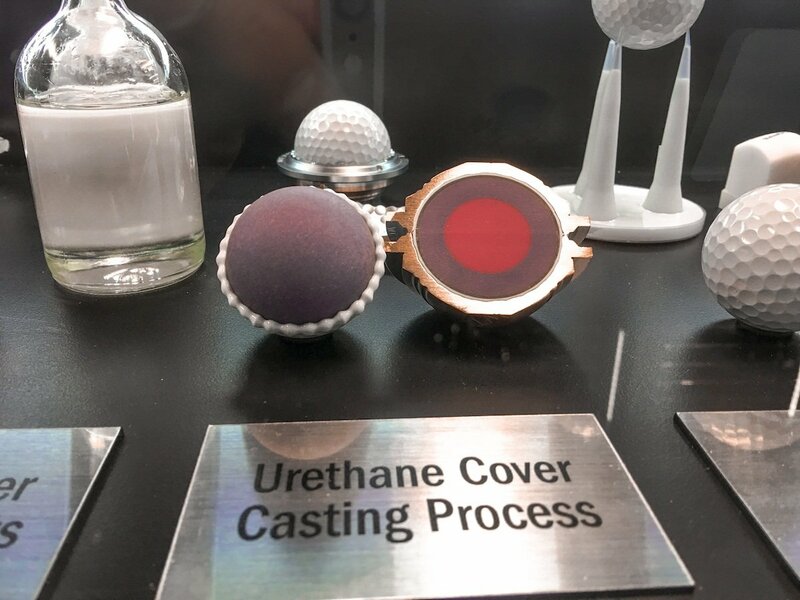 Each cast urethane mold makes four balls at a time. 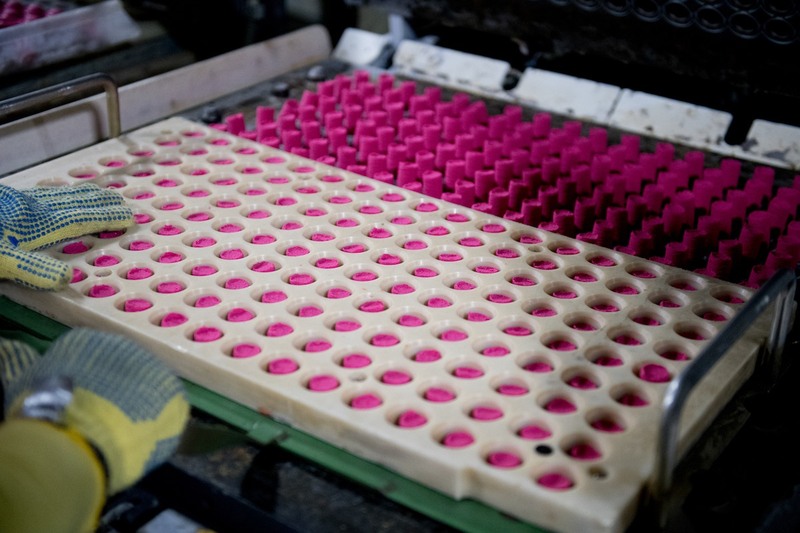 The liquid urethane is first poured into the bottom half of the mold, and once it reaches the consistency of chewed bubble gum, the core is pressed in, creating half a dimpled cover. While this is happening, the other half of the mold is prepped. When ready, the first mold is flipped and pressed into the other half to form a complete ball. The mold is then slowly cooled to harden the urethane. 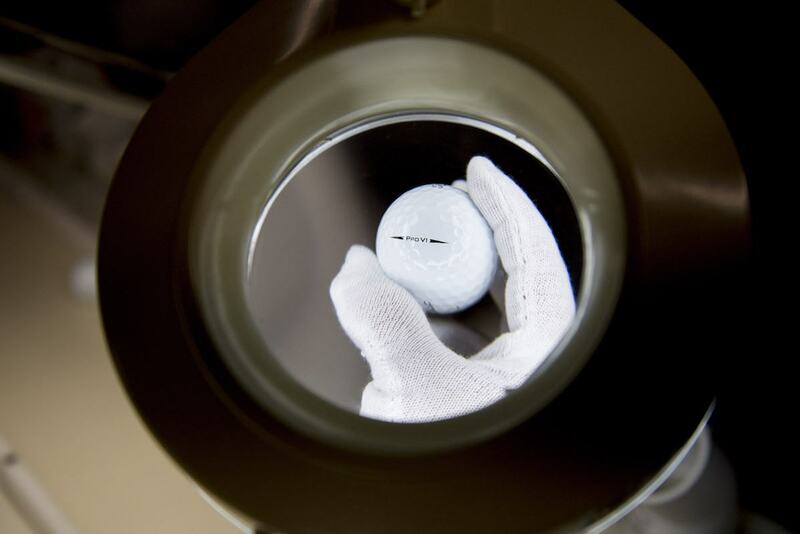 It takes about 45 minutes for each 4-ball mold to go through the entire process. Titleist runs at least 13 cast urethane lines during each of its three daily shifts. The balls are then buffed, cleaned and prepped for the final stages. Hank tells us most ProV returns are for cosmetic reasons, usually hair or fibers in the ball finish. 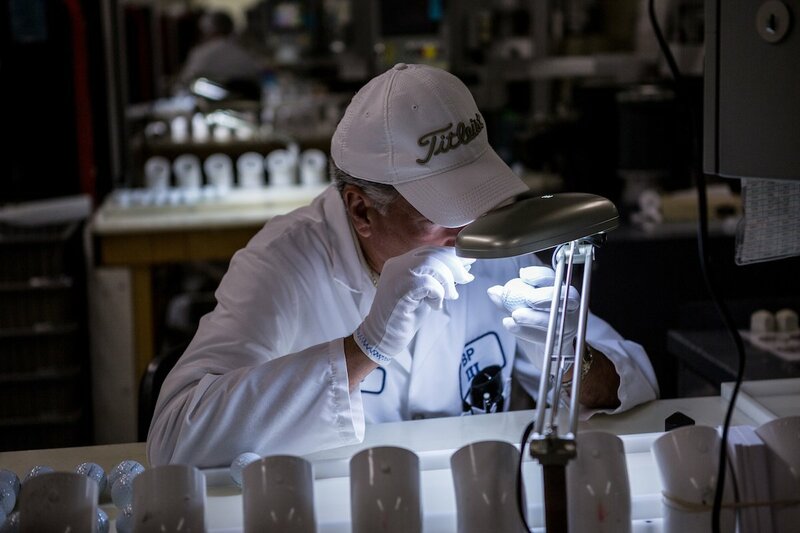 To combat that problem, Titleist uses a near-clean room environment for painting and finishing – we all had to wear disposable lab coats and hair nets in the painting room. Bearded gents, including our tour guide, also had to wear hair nets over their faces. The balls get two very thin coats of paint. They sit on little perches on a conveyer belt as a robotic paint arm sprays away. There’s a two-hour drying cycle after each coat before the balls head to the second most fascinating part of the tour, the labeling area. Labelling is another robotic process. A machine quickly adjusts each ball such that the printing is on the same plane every time. The robot jostles the ball and is able to find the seam in what seems like a millisecond before moving it into position for printing. The Titleist logo is always on the pole of the ball, and the ProV1 sidestamp is always on the equator, where the seem is. The printing machines stay busy labeling balls with numbers 1 through 4. Titleist does build up reserves of numbers 5 through 99, so if you want a dozen 87’s, they’ll have them in stock. Further customization, such as names and logos, are added at a separate facility in New Bedford, where packaging and shipping also take place. Lastly, every single ball goes through an X-ray machine for one last check before leaving the building. When you’re the #1 ball in golf, there’s usually only one way to go – and Titleist has seen some gnawing away at its market share in 2017. Callaway is making inroads, and Bridgestone is always a factor, as are Srixon and Wilson. The Kirkland thing certainly didn’t help, and direct-to-consumer competitors are creating their foothold. So, is a visit to Ball Plant III worth your time? If you live nearby, it’s an absolute no-brainer. If you’re planning a Cape Cod golf vacation or visiting Boston or Providence for business or pleasure, New Bedford is an easy side-trip, and the 90-minute tour leaves you plenty of time to visit the New Bedford Whaling Museum. Or, if you’re into the macabre, you could drive about 15 minutes west to Fall River and visit the Lizzie Borden house. You know, just for laughs. 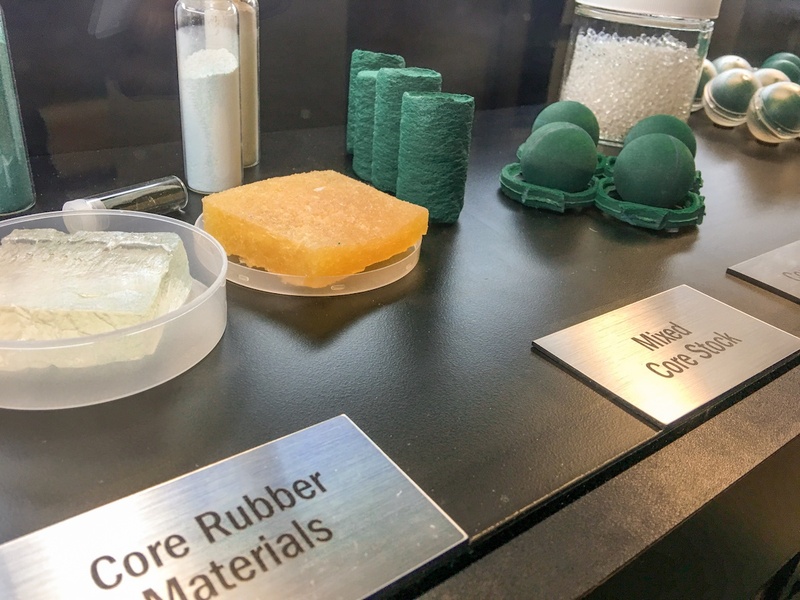 One thing is for certain, after touring Ball Plant III (and, if you ever get the chance, Bridgestone’s equally impressive Covington, GA factory), and seeing everything that goes into making a single golf ball, you may find yourself amazed they’re only $4 a pop. And you’ll think twice about trying to clear that water hazard. TIL, Pinnacle, which is the 1st ball I used when I started playing is made by the same people behind Titleist. Wonder if they put them under the same QA/QC as the ProVs. Too each his own, but visiting a factory that makes golf balls (or any golf equipment) is DEFINITELY NOT on my bucket list. Been in factories my whole working life, seen enough. Playing Arnie’s courses, Bethpage Black, Pebble, etc. are worthy of a bucket list…golf ball plant in a crappy part of Mass., not so much. Pretty interesting and glad John went through it for us. I doubt I’d ever visit a ball making factory unless it was located in my hometown. I’d like to see a program about this on How it’s Made or Modern Marvels. IMO Titleist is the gold standard for balls. But, how is it that Snell can also make a gold standard equivalent without owning his own factory? Perhaps the same might also be said about Ksigs or even MG’s or Vice? Will there ever be a day when some big time Tour player goes rogue – plays and wins with a Snell for example? Or an MG or Ksig? It would rock the “ball” game world. We all know these guys could certainly compete and win with a Snell for example. Lastly, I’d like to send John to the Snell or Vise factory and let’s see how these tour quality balls are made. Maybe MG, Snell, Vice all come from the same place? Perhaps Dean Snell might be able to shed some light and provide a tour for us? I had a friend that used to work at the plant and one interesting fact was that they essentially ran a continuous line of tanker trucks up to the plant to provide the necessary heating oil for the plant’s furnaces as it takes quite a lot of heat to manufacturer the balls. 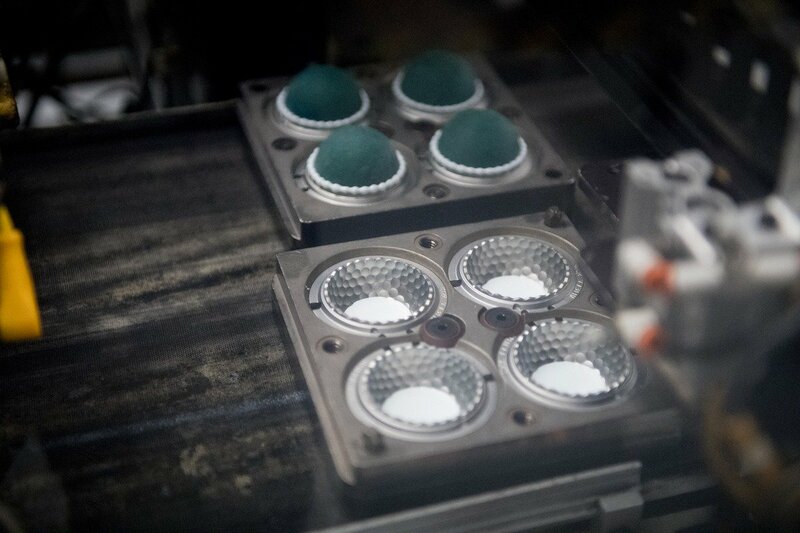 Not sure if that’s still the case, but it’s amazing how much technology goes into making a tour quality golf ball. Apparently they make the Callaway Chrome Soft balls at the other end of the state too, so i guess MA is the place to make quality golf balls too. Always impressed by Titleist. They are the goal standard. I’m playing the upstart Costco Kirkland ball because I have found no difference (8 Hdcp) and they bring Titleist inflated prices down from the stratosphere. The question is why are the Pro Vs more expensive in Asia if they are made there? Are they the same ball spec wise? I think you’ve answered your own question… They’re shipped halfway across the world. I think you’ve answered the wrong question. I think he’s asking why they’re so expensive in Asia, and therefore not shipped halfway across the world. If I recall correctly, the packaging on our range balls from Titleist (Acushnet… Fila) says ball plant 3. 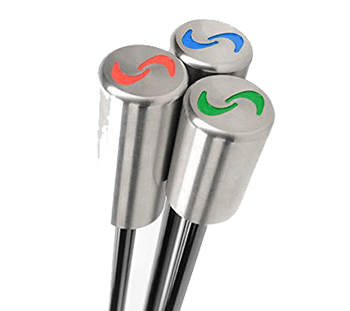 Our range balls have our logo on them, and after having put approximately 2,000 dozen into circulation personally, and removing hundreds (maybe 1,000) of those same balls, I can comment through the perspective of an avid golfer, and a former ball hawker. I’ll say this: I approximate the range balls we order are hit by a driver and wedge 80% of the time. After a ball has been hit 300 times it then falls into the category of “average range ball”. And in my dealings with staff at Acushnet via telephone, quality is the word I choose to describe both product and service. I’m scheduled to go on the tour January 12, 2018 and I can’t wait. I’m very interested in seeing and hearing what the difference between the Pro V1 and AVX is and how that is going to relate to everyday play. I’ve heard the best placement on a tee is the titleist name to the rear so U contact it with the club. Old wives tale or not? Stopped at the TaylorMade plant in Liberty, SC. Big building/big sign overlooking Hwy 123. Doesn’t do tours!!! This is now on my bucket list. I’d love to see the process in person. Nice article on the tour. Well done. Good read John! I recently toured the Bridgestone Plant, and was very impressed with it. Our local B’Stone rep used to rep for Titleist and told me afterward, how much larger the Titleist one is, I can imagine it took 90 minutes to see the whole thing. It is really fascinating to walk through the entire process from being a block of polymer to seeing the finished product. Did I see pit of misery? Dilly, dilly! Hi, I just took the tour in Dec. and it was fantastic. … I highly recommend it to any golf aficionado. Extremely enjoyable and the gift shop at the end could cost you a bit, bc there’s things there you can’t just find anywhere,good stuff too. .. but it’s optional. Thank you BALL PLANT 3,it was a bucket list check off!!! So do they not do x-outs anymore? I haven’t payed much attention. And when they did, was this still the protocol? That would prove that x-outs are strictly cosmetic defects with no bearing on performance. No? Our tour guide did say that X-outs are long gone, and that they were primarily cosmetic defects. The new painting and printing processes have solved those problems. Dicks still sells X-Out Pro V1s. $29.00. I always thought they were simply cosmetic….. a logo overrun, or paint splatter type thing. Nice article. Impressive production Titleist!!! Clearly there is overhead, and marketing and hype, but nowhere near as much as some of the clubs or other equipment with seemingly exorbitant pricing… Thanks for sharing this insight with the MGS community! I’ve had the privilege to tour the Maxfli, Callaway, and Wilson ball factories. I was blown away by the sheer volume of golf balls running through there on a daily basis. What a great product! But. Is it intentional that Titleist balls lose that bright white finish more quickly than other brands? You know, make them look old sooner so the picky players among us will replace them? Can’t think of a better reason to buy Titleist. Wish they were available in Yellow. Try the AVX in Yellow if you can find them. Still limited availability, but they are around if you search. I am a dedicated ProV player and have been for many years. I wanted to test these new AVXs out of curiosity. I was extremely surprised at how well they preformed. Urethane cover. Great spin off wedges. At least as long as Pro V1. Unfortunately, just as expensive. Still have 4 or 5 dozen new 2017 Pro Vs leftover, but now have my eye on the AVX too. Has to be the best bright yellow ball on the market (they are also available in white). If they start selling them everywhere, instead of just FL, AZ and CA, I will have a hard time choosing between Pro V and AVX. While the yellow AVX may be hard to find there is a great playing alternative… The Srixon Z-Star XV in yellow. Long off the tee and great around the greens. Four piece ball with a urethane cover. I really love playing this ball. For the rounds when you want a yellow ball. Great article. Well done. Thanks! Very nice article. Guess I need to add to my bucket list. 100M ProVs per year, let alone there is a separate Asian plant (hey exports manufactured in US to Asia how novel) and the mass of other balls and this is just one of the market players. Gives you a good feel for a) how many balls we lose in the woods/ponds/etc a year and why this is such a huge $$ business that does lead to vigorous “protection” — I would love to see Titleist or someone else build a ball recycling program. Most Asian government limit or do not allow imports to come into their countries. A foreign company is regulated to build a facility in that country to produce their product(s) for that market.